These Dutch Cocoa Cookies are simply amazing! Deep, dark and chocolaty! They are slice and bake, so they are very easy! The Cocoa powder gives them tons of chocolate flavor, without all of the fat! I have been wanting to make these cookies for ages! I rarely, or more accurately, never buy store bought cookies! There are only a handful of them that I even like. I do like shortbread and these Dutch Chocolate Cookies! Archway makes a Dutch Cocoa Cookie here in the US, which are really good! So I decided to find a recipe that looked like it was feasible! This recipe is super good! I have made several batches to date and we really like them! The only thing that I will say about this recipe is that they rolled the dough in waxed paper and then chilled it. It does not work!! Take my word for it! The dough is so sticky, it sticks to the waxed paper and the waxed paper rips. It took me 15 minutes to get all of the waxed paper off of the first batch. The second batch, I used parchment paper, which worked better than waxed paper but still not wonderfully. The last batch I made, I wrapped the dough with the shiny side of freezer paper. This method worked the best, for sure! There is an omission in the recipe, as well. The sanding sugar needs to be sprinkled on before baking! Since these cookies are just a slice and bake, active time on these, is literally about 15 minutes. So easy and so delicious! Another super easy cookie that I make here on BCC is Ambrosia Macaroons! 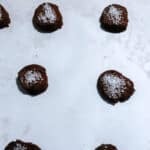 I hope you like the recipe today for Dutch Chocolate Cookies! Give them a try and let me know what you think! These slice and bake cookies are so easy and so delicious! Add eggs and vanilla and cream. Mix cocoa powder flour, baking soda and salt in small bowl. Slowly add flour mixture to the wet ingredients. Wrap in parchment paper or better yet, freezer paper, with shiny side towards the dough. Into 2 separate logs, about 2" wide. Refrigerate for at least 2 hours or overnight. Preheat oven to 350°F Unwrap rolled dough and slice about 1/2" thick rounds. Place about 2 inches apart on parchment lined cookie sheets. Sprinkle generously with sanding sugar before baking. Bake for 10 minutes. Let cool on parchment for about 5 minutes, then remove to rack to cool completely. These sound delicious, perfect for dunking into a tall glass of milk! I just love that they are slice and bake, too – so simple! They really are so easy and delicious!! Thanks Monica! These cookies look so good! And I like your troubleshooting of the original recipe. It’s always disappointing when a recipe which should work, doesn’t. Yes, this dough is really sticky! But so good! Worth trying! Thanks Annemarie! Love such simple and delicious cookies. Pinning for later! Thanks so much, Diana! I’m sure you will love these! Me want cookie! Especially chocolate cookies. They’re my favorite! Haha! Yes, the cookie monster would love these babies!! thanks, Maggie! Gimme, gimme, gimme. 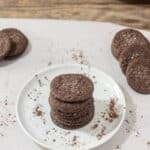 I love all things chocolate and these cookies look really delicious! You are a choc-a-holic!! These are right up your alley!! Thanks Elaine! Perfect timing Beth, I wanted to make something chocolate and only have cocoa powder, these are perfect for this raining weekend. These are totally perfect for you then, Laura! Only requires cocoa powder! Thanks so much for your comment! I don’t have one, but that is a good idea! Thank you Aleka!! Oh, yum! Have you tried to freeze the dough? I would like to bake a few here and there so I don’t devour the whole batch! There is no reason why this dough will not freeze. I would just cut them frozen and let them thaw a bit before baking or they won’t spread and cook properly. Thanks Sandra! I love simple cookies like these! Thanks for the tip on the freezer paper! Thanks so much for your comment, Pam! !